Urban pest birds such as pigeons and gulls are becoming a real problem in all areas. Bird droppings look unsightly and will damage buildings trhough direct chemical action and can block gutters and drains leading to water damage. 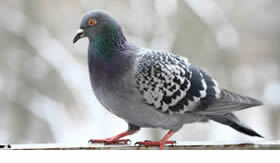 The main bird causing the problem is the Feral Pigeon (Columba Livia). These not only cause damage, but also transmit human diseases such as ornithosis, allergic alveolitus and cryptoccosis. Their droppings are extremely slippery, and can lead to problems in public areas. Pigeon nests can also block chimneys and flues causing a build up of dangerous and poisonous gases. The birds also cause distress through their noise and unpleasant smell and the larger birds such as gulls may actually attack humans. Our Bird Control Division specialises in pigeon and gull proofing and provides a range of services including surveying, cleaning, proofing, repairing existing proofing, maintaining new installations and providing all the access equipment needed. Proofing is achieved by methods such as bird netting, spiking, culling, scaring and installing bird wire systems at height. 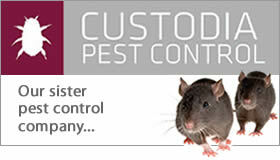 Other pests can be dealt with by our specialised company, Custodia Pest Control.